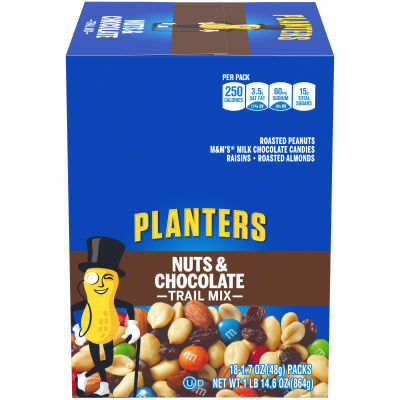 Enjoy a sweet and salty treat any time of day with Planters Nuts & Chocolate Trail Mix. Bursting with flavor, this trail mix includes roasted peanuts, M&M’s, raisins, and roasted almonds. - A treat with real chocolatey goodness, this Planters trail mix will give you the pick-me-up you need and satisfy both your mid-day and late night cravings. Stock your pantry with this 18-pack of 1.7 oz. snack bags.